More and more vegetable growers realize that it’s crucial to buy plants from propagators that apply biocontrol. A grower is indeed off to a bad start in biocontrol when plants come in from the propagation with chemical residues and with pesticide resistant pest populations. This is double the trouble! Why not start with plants on which natural enemy populations have already started to establish? Biobest works closely with vegetable plant propagators to help them implement biocontrol from the very beginning. The key to success: personalized advice and Amblyseius cucumeris mini-sachets, a powerful and cost-effective product to provide each and every plant with its own little biocontrol army. Methods for biological control in propagation have already been developed in the 1990’s. But they went out of fashion again when a new generation of pesticides (for example, abamactine and imidacloprid) came to market. Nowadays, with legislation becoming ever more stringent and resistant thrips rapidly spreading, biocontrol in propagation is back on the agenda. And it’s there to stay. 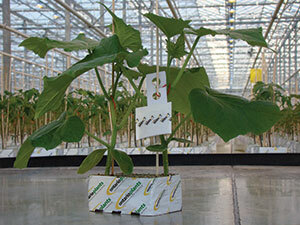 Biobest works closely with growers to develop tailor-made biocontrol strategies for each propagator.